Home / Christian / Inspiration / Can Anything Good Come From There? Jesus would rather not even go to Jerusalem. It was chaos. He much preferred more normal places with more normal people. He left more of His grace in those places than He did in the bigger cities. Actually, other than fulfilling the cultural necessity of attending Jewish festivals and events, Jesus largely ignored Jerusalem. He spent far more time in the idyllic hills surrounding the Sea of Galilee. The big-city folk in Jerusalem would have looked down on Jesus as a peasant who liked peasant sorts of places with peasant sorts of people. Jesus wasn’t the cocktail-party type. He was the son-of-a-carpenter type. The folks who shopped on fancy streets wouldn’t have given Him a passing glance. Jesus wore painter’s pants, not Prada. When Jesus did go to Jerusalem, it was a disturbing and difficult experience for Him. The religious and political leaders would often incite arguments with Him, and the commercialization of the temple seemed to drive him mad. Eventually, Jesus just bulldozed over it all, turning over the money-changing tables and making a royal mess fitting for the front page of the Jerusalem Post. In all likelihood, many people thought He was totally insane. Jesus wasn’t the kind of messiah who fit into the box. Most people were expecting a political messiah who would drive out the Roman occupiers, a savior who would play politics with the Pharisees and Sadducees, and a revolutionary who would set up a new kingdom in defiance of Roman rule. They expected a militant savior who would be impossible for the great Roman Empire to defeat. Jesus instead liked to help sick people, loved playing with children, hated to pander to the politicians, and didn’t much care what the people who “mattered the most” thought of Him. According to Jesus’ own words, these powerful leaders were nothing but “whitewashed tombs” (Matthew 23:27). They were sons of Satan and “wolves” (Matthew 7:15). And that’s exactly how they viewed the Son of God — as an extremist. Things always came to a head at the temple. The temple sat like a crown atop Zion’s hill in Jerusalem. It was a place of deep historic and spiritual importance for all Jewish people, including Jesus. But it was also a very difficult place for Him. Everything that was good about Judaism and everything that was horrible about it had collided in that place and in that international city. In some sense it was the epicenter of a war that was raging in the hearts of the Jewish people. When Jesus came to Jerusalem He was stepping onto the front lines of that war. This is one of the reasons Jesus found deep solace in the quiet northern plains of Israel. It was here that He felt most at home, not in the bustling, cosmopolitan, dog-eat-dog world of Jerusalem. 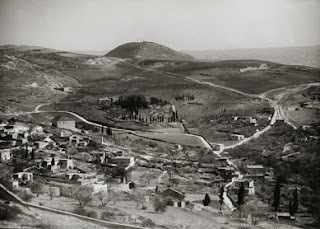 For one thing, Nazareth, the city of Jesus’ childhood, sat in those northern plains. His dear mom and His father’s carpentry shop were there too. It was where His momma had cooked the meals of His childhood, where His first friendships were made, and where numerous parties and weddings and festivals went reveling into the night. Nazareth was where Jesus could let His hair down and be as human as He liked. The critic, the Bible says, “took offense at Him.” (Matthew 13:55-57) Why? He was from Nazareth. Jesus was a “small-town” type of guy who seemed much more comfortable in the tranquil rhythm of a fishing village around the Sea of Galilee, or observing His father’s carpentry, than in the cacophony of the big city. He wasn’t a big-city type of guy with designer clothes and a trendy lifestyle bent on impressing people. Jesus never wanted to be a celebrity. He was a Boy from the rural north, and the privileged of Jerusalem weren’t too impressed with the children of working-class people from Nazareth — of all places. It’s a fascinating mystery that when God scanned the earth to find the place where Jesus would grow up, He chose a carpenter’s home in a typical Middle Eastern village. He didn’t zero in on an epicenter of power or of influence. He didn’t make Jesus the golden child of the aristocrats. Nope, the King of kings grew up in a simple home, eating village food, and living a village life in near obscurity. Perhaps if a caravan of Roman or Jewish leaders had seen the young Jesus playing on the side of the road, they would have assumed that He would never amount to much. He would have been underestimated and ignored. Meanwhile, that boy Jesus had the power to shut off the sun and melt Mount Everest. He could have turned the Mediterranean into a boiling pot of lava, and He could have, with a passing thought, made the great Roman cities crumble into dust so fine that a gust of wind could have blown them into the sea. This little Jewish boy was the most formidable person on planet Earth, not only at that time but for all time. But He chose to live the life of a regular man.